This module extracts cropped images around the N most salient (i.e., conspicuous, or attention-grabbing) locations in the JeVois camera's field of view. These regions are then streamed over USB, one of top of another. This module thus produces an output mainly intended for machine use: a host computer might grab the regions detected by JeVois, and run, for example, some object recognition algorithm on each region. See DemoSaliency for more information about visual attention and saliency. The number of regions extracted (N) is decided by the height of the desired USB output image, while the (square) region size (width and height) is determined by the output image width. Note that region width and height must be a multiple of 4. ALso note that Mac computers may not be able to grab and display video of width that is not a multiple of 16. The most salient region is on top, the second most salient region is below the first one, etc. in JEVOIS:/config/videomappings.cfg, this module will extract three 64x64 salient regions, and will send them over USB one on top of the other (since USB video width is 64, which determines region size, and USB video height is 3x64 = 192, which determines the number of regions). Definition at line 83 of file SalientRegions.C. Definition at line 88 of file SalientRegions.C. Definition at line 92 of file SalientRegions.C. Definition at line 95 of file SalientRegions.C. References jevois::RawImage::height, itsSaliency, jevois::RawImage::require(), jevois::rawimage::roipaste(), and jevois::RawImage::width. 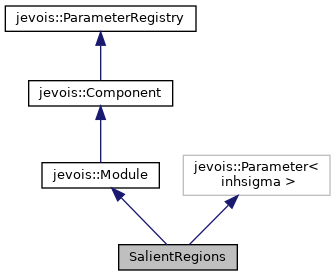 References jevois::RawImage::height, itsSaliency, JEVOIS_REGISTER_MODULE(), jevois::RawImage::require(), jevois::rawimage::roipaste(), and jevois::RawImage::width. Definition at line 141 of file SalientRegions.C. Referenced by process(), and SalientRegions().